December 8-15, 2018. Back to Texas. We headed back south and will be revisiting TX, LA, MS and AL over the next six weeks. We hit the southern parts of these states south of I-10 last year at the beginning of our trip but now we are hitting the northern parts. First stop on our path back to Georgia is the Dallas/Forth Worth area. We passed through a border town called Texarkansas…funny! We stayed at Lyod Park on the south side between Dallas and Forth Worth. We loved our huge site in the woods but we forgot to get a picture of this site. They have nice covered pavilions at each site. The huge lake would be great during the summer months. Don’t be fooled by Abby’s outfit…it was not warm. She is just immune to the cold. Visiting the site of the assassination of JFK was eerie. Seeing it depicted on history channels and in movies and then standing in the very spot it happened was surreal. This is the spot the famous ‘Zepruder film’ was taken. This is the most complete film of the shooting, giving the clearest view of the side where the president’s fatal shot is visible. It is one of the most studied films in history. Abraham Zapruder was just a private citizen that had just purchased the 8mm color camera to video tape this event. Right before the fatal shot. We took the audio/visual tour of the Sixth Floor Museum, which I highly recommend. 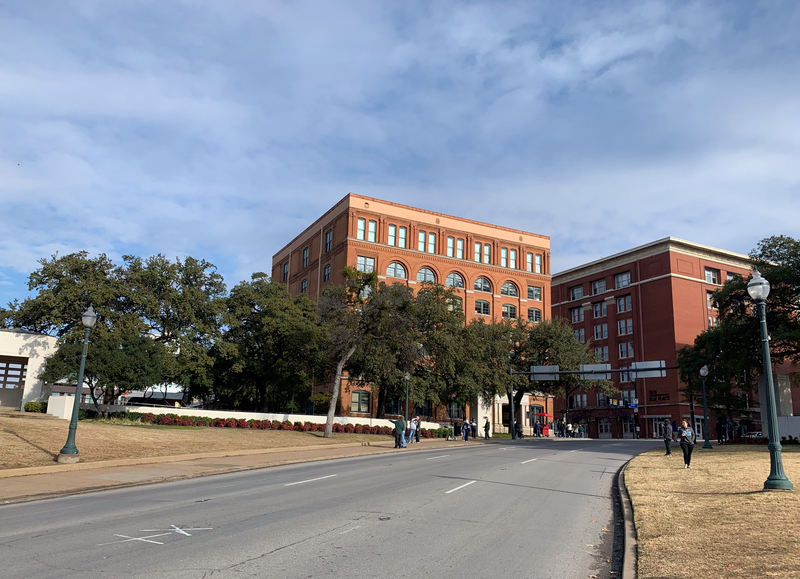 The museum which is located within the former Texas School Book Depository building, chronicles the assassination of President John F. Kennedy on November 22, 1963. Here is a picture of the room where five government investigations concluded that Lee Harvey Oswald shot and killed Kennedy all by himself. Pictures from inside the museum. We visited on a Sunday and it was super crowded because there was also football game in town so people were visiting the museum before the game. I missed that fact when I planned to arrive early Sunday morning when it’s usually the best time on a weekend to visit tourist locations. On Sunday’s we always pack a lot in because Chris has off so we take full advantage of the day. Next we headed over to George W. Bush’s Presidential library. It had been a week since the passing of his father George H.W. Bush so they had a small memorial and a condolence book in the lobby that we signed. We really enjoyed the Christmas in the White House exhibit. There is a full size replica of the Oval Office and this one we could sit in all the chairs and take as many photos as we’d like. This library might be our favorite. It was very hands on and interactive. The 9-11 exhibit was emotional. Mackenzie lost her tooth and since our elves are visiting for the month they took her tooth to the tooth fairy and brought treats back. The next day she lost the one on the other side. Mackenzie’s kindergarten teacher retired and moved with her husband out west. She’s now in Fort Worth so she invited us over to spend the night. We had fun catching up, crafting and going out to dinner. We made Grinch snacks and did a little science experiment. We got to hear all about her event with the Queen of England and ate a yummy Mexican restaurant called Rosa’s Cafe and Tortilla Factory. Thank you Mrs. Ulmer for a your hospitality and friendship! We heard Santa was going to be at a mall in Dallas so we headed that way on a Thursday morning. We had to wait about 45 minutes to see him. He was super sweet and took a lot of time talking to the girls. Every year the girls write their letters to Santa at the Macy’s believe station. We had found a Macy’s earlier in the week but they didn’t have one. We were so happy to find this Mall had one. This museum was on our reciprocal list so we stopped by on our way home from the mall. We had an hour and a half and felt rushed. I was excited because they had a whole exhibit on genes which we were in the middle of studying. I highly recommend this museum. When the sun sets at 5pm in the winter and it’s cold and rainy…we play board games, Xbox and watch movies. On the drive to our next stop in Galveston we stopped at George H.W. Bushes library. There was a 20 minute wait to get tickets- it was so crowded. There was an hour wait to visit the gravesite. His library also has a replica of the oval office in which we can take photos. I just love seeing how each president set up their office.